Follow the debate via our live-streamed session Africa's Fourth Industrial Revolution – taking place at 11:00 on Thursday 12 May at the World Economic Forum on Africa, in Kigali. The idea that exponential technologies – those innovations that change the world as we know it – might allow Africa to lead the way in the Fourth Industrial Revolution seems far-fetched for some. After all, two in three people on the continent lack access to electricity . But it’s precisely these types of deficiencies that could allow Africa to use existing technologies such as 3D printing, artificial intelligence and the internet of things to become the next great “leapfrogging” success story . By leapfrogging directly to cutting-edge technologies, Africa can bypass the industrial phase in which developed countries invested in now cumbersome technological infrastructure – and bypass the cost of revamping it as well. This is of particular importance when it comes to addressing Africa’s deficiencies in basic needs. As Peter Diamandis points out in his book Abundance , exponential technologies can accelerate access to water, food, energy, healthcare and education. And a whole new wave of entrepreneurs and innovators in Africa are doing just that. Take agriculture. Technologies from sensors to mobile to predictive analytics are driving new models and outcomes. Kenyan digital platform MbeguChoice is a joint effort by researchers, agriculture inspectors and seed specialists that asks a series of questions to help farmers determine the best seed choices. Start-up UjuziKilimo provides tailored recommendations on planting via text message to farmers by using sensors to measure and analyse soil qualities. And recognizing the increased demand for farming data and analytics, Gro Intelligence maps any form of agricultural information to its classification system, enabling comparable sets of data. Already more than 70% of African farmers have used information and communications technology, with 90% percent seeing increased overall output . Similarly, exponential technologies are helping healthcare leapfrog over constraints in communication, transportation and affordability. Platforms that use mobile technology, such as Clinic Communicator , ensure patients and doctors can communicate even when meeting face to face is a challenge. Code 8 – invented by four young Ugandans – uses a sensor device on a smartphone to diagnose malaria without a blood sample. Increased access to 3D printing even allowed South African surgeons to “make” a jaw implant when conventional options were too expensive. Just as striking is the fact that it was only the second time a 3D implant had been used in this way . This innovative and entrepreneurial drive is key to Africa’s future success – and clearly exponential technologies can accelerate that success. Yes, there are many obstacles to overcome in Africa. 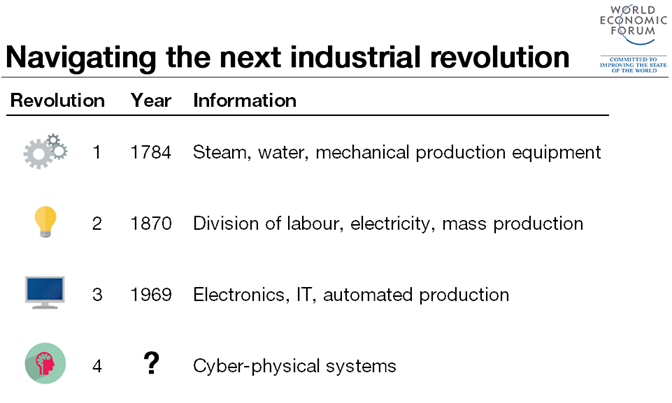 But for an economy to leapfrog to the Fourth Industrial Revolution, turning those disadvantages and deficiencies into opportunities is the first step.